If you have a patio or deck, you probably look forward to entertaining friends during summer days and evenings in your outdoor space. It’s also a great space to simply relax outside when you have downtime. With many outdoor decor ideas, you can make the space into your personal oasis. As the temperatures start to drop in fall, though, you may believe that your days of enjoying the patio are coming to an end for the year. It’s true that dealing with the snow, ice, and low temperatures can make this space less attractive. Luckily, there are many winter patio ideas that can extend your outdoor enjoyment well into the colder months of the year. Instead of spending your winters indoors, you could follow a few patio remodel ideas that will make your outdoor space more comfortable when it’s not as warm. This post will look at some winter patio and backyard deck ideas that can make outdoor entertaining possible all year. It will be important to heat and cover your space, protect it from wind, and find outdoor furniture that will hold up to various weather conditions. If you will be spending time outside during winter, heating is going to have to play a role in your patio renovation plans. With a patio or deck that is adjoined to the house, you might have an outlet that will allow for a space heater. But, having the option to build a fire can be one of the best outdoor décor ideas. It also means you don’t need to worry about electricity costs. An outdoor fireplace is one popular idea for heating your deck or patio, but if you are looking for backyard patio ideas on a budget, you could go with a fire pit or a chimenea. You could also look for premade fire pits that you can install on your own, or follow an online DIY fire pit design to make one yourself. Spending time outside during the winter means you are going to have to deal with more than just the cold; you’ll also need to consider the possibility of snow and rain. When you are compiling your deck and patio design ideas, you may want to think about building some type of cover or roof to keep you dry in your outdoor space. You have several temporary covers for decks and patios to choose from, but most of these are designed for summer use. While these work as a temporary winter patio solution, they might not stand up well under the conditions. Consider having a permanent cover built over your deck or patio if you want something more durable. If you want to save some money and feel like you are up for a larger DIY winter patio project, you can even manage to complete this patio remodel idea on your own. You might need help from a few friends along the way, and you’ll definitely need tools like a power saw and a drill/driver. Even with heating and a roof, the wind can still make things uncomfortable on your patio. A simple solution to this problem is to find an outdoor patio enclosure for winter. Many of these are made of materials like vinyl and can be easily removed during the summer months. If a temporary patio enclosure does not sound like the right option for your winter patio renovation, you could try a natural solution like planting trees to block the wind. By adding some coniferous trees to your winter patio ideas to-do-list, you can have protection from the wind in the winter. Best of all, this is an easy to maintain winter patio feature. With the 40V Cordless Hedge Trimmer, you will have no problem keeping your trees and shrubs looking good throughout the year. Whether it is summer or winter, you are going to want some furniture to help make the space comfortable. That said, if you plan to keep the furniture outside during the cold winter months, you are going to need to find pieces that can last in tough conditions like cold temperatures and snow. They should also fit in with your current deck and patio design. Finding the best patio furniture for winter means looking for pieces that are made from durable materials and items that have a weatherproof finish. You certainly can buy good outdoor furniture that will stand up to the winter conditions, but you could also build your own outdoor furniture from scratch. 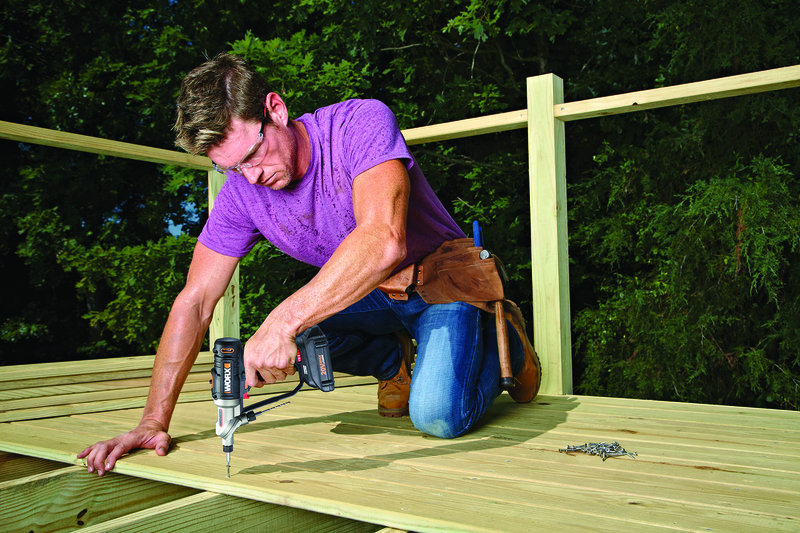 With tools like a 20V Impact Driver and the ExacTrack 20V 6-1/2” Circular Saw, you can build chairs and tables that will last for several years of outdoor use. It’s also a great way to ensure the features will be cohesive with the rest of your outdoor décor ideas. With a little bit of planning, you can implement a range of winter patio ideas that will make your outdoor space more useful even when it is cold outside. Some of these require a bit of an investment. However, with the right tools and enough time, you can save money by doing a lot of the work for your patio remodel project yourself. Turn your winter patio ideas into reality. When it comes to creating the perfect all-weather outdoor space, tools from Worx will help you get the job done quicker. It will be important to heat and cover your space, protect it from wind, and find outdoor furniture that will hold up to various weather conditions.